Hearty meals that are bold enough to satisfy a wintry craving, but light enough so you won't feel like you've eaten half a horse? 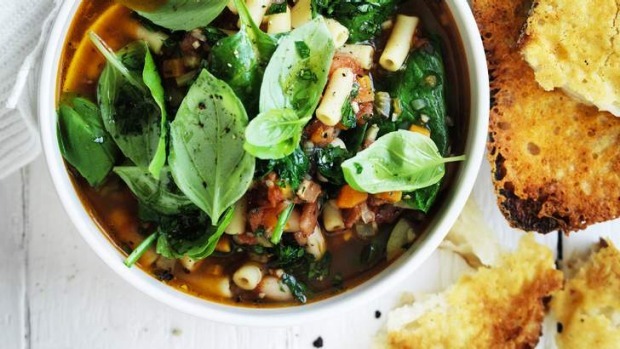 Try this minestrone - so thick that it's almost like a stew. You can even pile it onto the croutons and eat it like bruschetta. Heat the olive oil in a large saucepan over medium heat and fry the bacon until it's lightly browned and the fat is rendered. Add the onion, garlic, carrot, celery, zucchini and mushrooms and fry for about 10 minutes until the vegetables are softened and fragrant. Add the tomatoes, stock and salt and bring to a simmer. Simmer for 20 minutes, then add the beans and macaroni and simmer for a further 10 minutes until the pasta is tender. Stir through the spinach, basil and parsley and allow to stand for 5 minutes. Adjust for seasoning. For the croutons, thickly butter each slice of sourdough and scatter with the parmesan. Press the cheese onto the butter so that it holds firmly. Heat a frying pan (preferably non-stick) over medium heat and fry the croutons cheese-side down for around 4 minutes until the cheese is browned and crisp.